CHICAGO — Most of the experts who prepared the world's leading medical guide to mental illness had undisclosed financial relationships with drug companies that presented potential conflicts of interest, according to a report published today in the journal Psychotherapy and Psychosomatics. The study is the first to document extensive monetary connections between drug companies, psychiatrists and other scientists responsible for the American Psychiatric Association's Diagnostic and Statistical Manual of Mental Disorders. The DSM, as it's commonly called, defines all the mental illnesses recognized by psychiatry and outlines the criteria used to determine whether a person has one of these conditions. Medical professionals refer to it as the "bible of mental health" in the U.S. 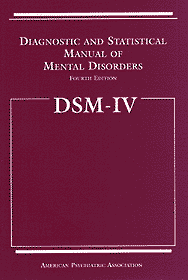 The current version, the DSM-IV, was published in 1994 and modified in 2000. The manual is of enormous importance to pharmaceutical firms, as the Food and Drug Administration will not approve a drug to treat a mental illness unless the condition is in the DSM. Drug companies then can market approved medications to physicians and consumers. And the broader the criteria for a disorder, the more people who might be considered candidates for treatment. "This is one of the most important medical documents we have in this country, yet the public doesn't have relevant information about the experts involved in developing and revising it," said Sheldon Krimsky, a Tufts University professor and co-author of the new paper. His study found that 56 percent of 170 panel members responsible for overseeing the DSM-IV had some type of financial tie to the drug industry — including getting research grants from drug companies (42 percent), serving as consultants (22 percent) and participating in speakers bureaus (16 percent). These relationships weren't revealed publicly. The risk is that financial relationships might directly or indirectly bias panel members to make decisions favorable to the drug industry. The enormous growth in prescriptions for psychiatric drugs also raises concerns about the potential impact on consumers. "If a medication is strong enough to have a beneficial effect, it's powerful enough to have a toxic effect as well, and we should care about how these drugs are prescribed," said Dr. Drummond Rennie, deputy editor of the Journal of the American Medical Association. Dr. Darrel Regier, director of research at the American Psychiatric Association, said disclosure of potential conflicts of interest "wasn't the standard in the field" at the time the latest edition came out. "For the next revision," due in 2011, "we will have full disclosure," he said. Of particular concern, Krimsky suggested, is his study's finding that 100 percent of the experts on DSM-IV panels overseeing mood disorders and schizophrenia/psychotic disorders were financially involved with the drug industry. These are the largest categories of psychiatric drugs in the world, racking up 2004 sales of $20.3 billion and $14.4 billion respectively. Depression is the leading mood disorder. "The more lucrative the drug market, the higher the percentage of experts with financial ties. That has to raise serious questions about these panels' objectivity," said David Rothman, professor of social medicine at Columbia University.